Hearts and February go hand and hand but we wanted it to include Gods heart as well. This time I had to break out the books and the magazines. The Mailbox is a great resource for any teacher. I found the heart in one place, I found a saying (not quite this one) in another and the rest came from a different board in another classroom. The heart is made up of white and read hands. Start out by making the biggest heart, just the outline, for the bottom or base of the heart. Put the hands down with the fingers out. Now add the next layer using red hands, overlapping the white palms. The top layer is white in this photo but I think pink would work nicely. Overlap to make the top heart. Now take your black hands and form an arrow through the heart. The saying that I found was something like, ‘From Our Hands to Your Heart’. And as always I try to give God the glory in what I do, and it’s a great way to show how to do it to the kids, a great object lesson that they’re a part of. Ok, so I took a look at what I was doing. The arrow was pointing up, we use our hands to show prayer and ‘ding, ding, ding’, I have my saying 'From Our Hands to Gods Heart'. I took the hands idea from another teachers board, click here to see it. I then found some hearts on my photo editor and put them all on one page. I asked each student to the computer, one at a time, and had them pick out the heart they liked. I then copied that heart into a new work area and opened a text box and had them type in a prayer request or praise that they had. When everyone was finished I printed them out. 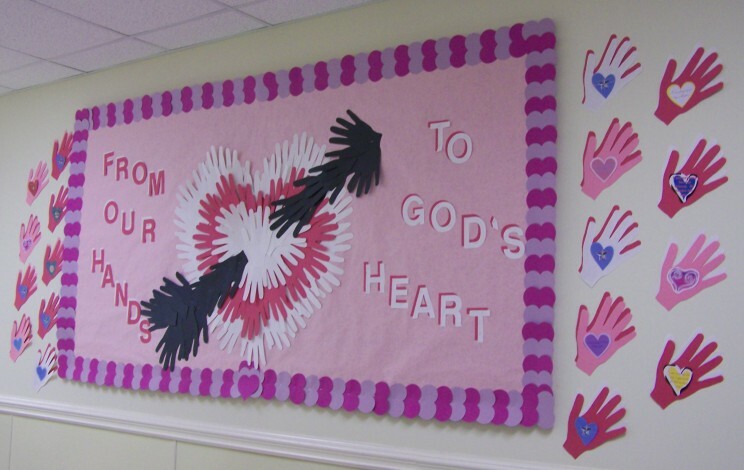 The hearts were cut out and attached to the hands, then added to the board. The boarder was just over lapped hearts. Leave From Our Hands to Gods Heart and return to the holiday page.